Yesterday Milan Hulsing gave me a copy of the book that he and Michiel de Jong have made last year, and that I mentioned last week, here. It is finally out! The comic book is published by Oog & Blik and can be bought at any comic book store, of ofcourse online, for example here. 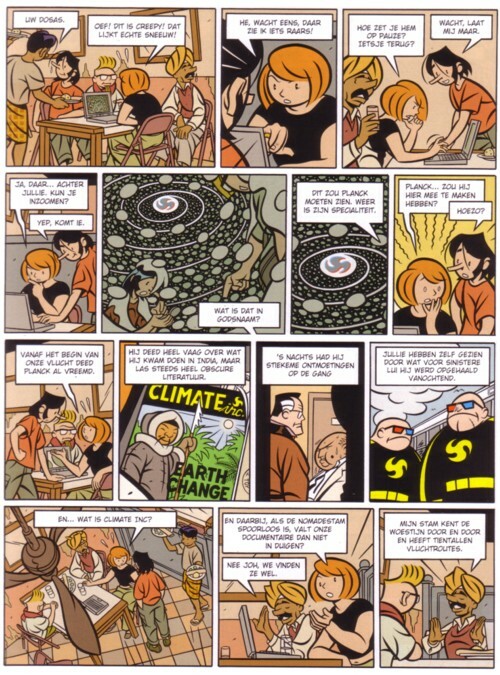 “Operatie Hanuman” is a comic story in a tradition. The most popular European comics were made without any pretension. It was pulp, in the positive meaning of that word. Many of today’s comics are very different. I have no problem with that, but I do like pulp and I wish there was made more good pulp made today. Milan and Pieter sure did a good job! The story is about a young women and a professor who get involved in a mad science project that is threatening to destroy the world. Of course Milan’s interests are all over the pages: even the Bollywood movie industry is woven into the story. Michiel de Jong is known as a great comic artist, but now there is finally a book to prove it. Go and get a copy! Here is a Bollywood song from one of the cassette tapes that Milan made me long ago, “Pyar zindagi hai” by Kalyanji Anandi, from the soundtrack to the movie Mugaddar ka sikandar . I just happened to look at this post while searching for some info on google. but I loved the way you talked about this comics.also it was pleasant that you put a Hindi song also with the post.